DC Contemporary Dance Theatre/El Teatro de Danza Contemporanea’s (DCCDT/TDC) 2017-2018l Season, " Celebrar Diversdad " celebrates DC’s diverse cultural heritage and the Company's history in both the US and Latin America. DC’s first multi cultural dance companies that brings diverse communities together through concert dance, presents an exhilarating display of contemporary, classical and indigenous repertory reflecting their Central American, Africa and Asian roots. This Season, the Company honors their mentors and welcomes back former Associate Artistic Director, Lloyd Whitmore, and the presentation of half an evening's program of his works with world premiere, I Don't Want What I Haven't Got", his most reknown lighting quick Horton full ensemble piece created to the music of Sinead O'Connor; and Songs Without Words, a 3-section uplifting neoclassical ensemble created to the allegro and adagio music of Brandenberg, Bach, and Bobby Mcferrin. Tracing back to the origins of the Company’s indigenous roots in Central America, the Company will present Pajaro Pintados, choreographed by Salvadoran Founder/Co-Director, Francisco Castillo. This athletic, colorful, indigenous work reflects the arching natural beauty and sensations of El Salvador, created to the pulsating rhythms of Mickey Hart. Reflecting their ten years of post war reconstruction work in El Salvador, TDC will present their signature piece,Y Ahora La Esperanza, to the musica of Ennio Morricone and Sting, created by Miya Hisaka Silva for the signing of the Peace Accords in l994, that honors the 80,000 lost Salvadorans from their 12 year civil war. And reflecting the Company's extensive history with classical ballet in Latin America, the Company will present Gloria Contreras' passionate poetic duet, Intermezzo, danced by guest artist and Cuban virtuoso,Fidel Garcia (DTH and Wash Ballet) and Wanyi Ng. The Company is proud to expand its membership to 13, with some of the area’s most recognized concert dance artists: Maurice Johnson, JP Flores, Max Maisey, Chandini Darby, Joan Ayap, Chiesa Mason, Therese Gahl, Wanyi Ng, Zenas Okanlowan, Rebecca Presti, Kate Page, Ian Edwards and guest artist Fidel Garcia. This performance is funded by the DC Commission on the Arts and Humanities, and in part by the National Endowment for the Arts. 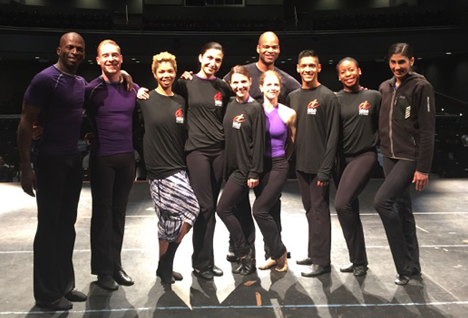 The Company is in full throttle this summer with intensive rehearsals and classes in preparation for a sizzling 2015-2016 Season! 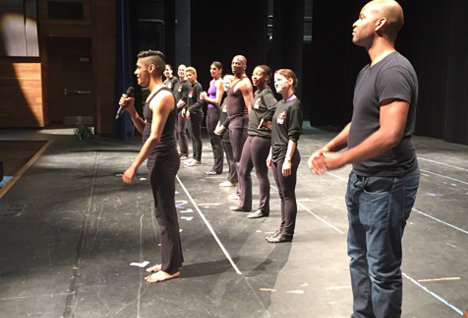 This Season, entitled DEEP ROOTS WIDE WORLD, celebrates the Company’s 30th anniversary in the District of Columbia. This year, we hope to bring awareness to the general public of both the City and Company’s rich and diverse cultural heritage. We honor and thank our many contributing artists, community leaders, staff, board members and many volunteers. After 20 years, DCCDT/TDC is proud to bring back to DC, prolific guest choreographer, Lloyd Whitmore (former DCCDT dancer/choreographer, faculty at Duke Ellington High School for the Performing Arts, and Artistic Director of New World Dance Company) to create world premiere, The Beginning of the After, a 3-section, high energy, elegant, sculptural, full company ensemble piece. 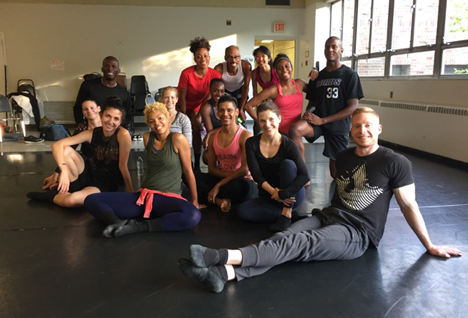 The Company will also be working with guest choreographer, Kevin Iega Jeff (So Deeply Rooted), to present Juntos – his allegra, playful, uplifting ensemble work to the rhythmic music of Pat Metheny. The Company will also present Adrain Bolton’s (Co-Founder/Artistic Associate) Ballet Jazz – a full Company volcanic explosion of movement to the music of Jean Luc Ponty. (Please see website Schedule Page for performance dates). DCCDT/TDC also had auditions in June, and welcomes aboard new company member, Zena Maddox (recent graduate of Butler University), and Apprentice, Rebecca Presti They join DCCDT’s dynamic list of performing artists: Maurice Johnson, Hannah Conn, Chandini Darby, Chika Imamura, Christine Doyle, Joan Ayap, Kourtney Ginn, Max Maisey, Sydney Ignacio, Vanessa Carmichael-Elder, and Will Hernandez. As Founder/Artistic Director, I give thanks everyday for the opportunity to create such high quality concert dance. Since the inception of this organization, which has spanned three decades and two continents, I know I am truly blessed to be able to work with such outstanding artists and human beings! 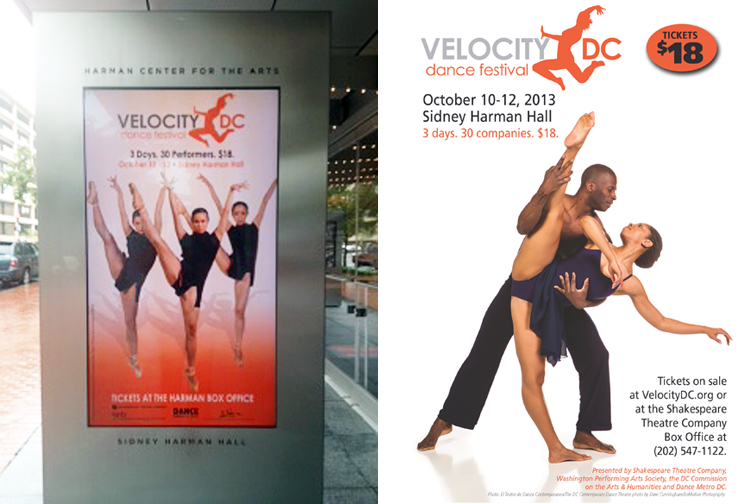 We thank you in advance in supporting a very important cultural vision for the District of Columbia, in this monumental and very important 30th Season! 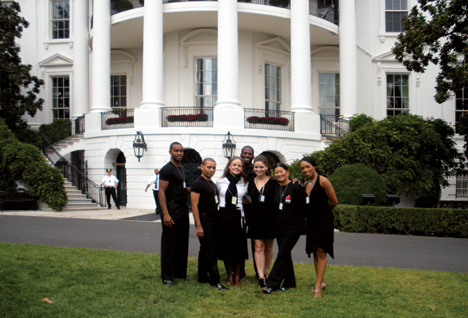 Celebrating 30 Years of Dance in DC! Come celebrate 30 years of dance in the District of Columbia with The DC Contemporary Dance Theatre/El Teatro de Danza Contemporanea (DCCDT) at Dance Place on February 7-8, 2015 (Sat. 8 pm; Sun. 4 pm). “Deep Roots Wide World” celebrates a part of DC’s rich cultural heritage with Founder/Artistic Director, Miya Hisaka, presenting a retrospective of historical repertory that spans three decades as well as the evolution of ethnic dance in DC and nationwide. DCCDT is proud to present critically acclaimed choreographers, Kevin Iega Jeff (So Deeply Rooted Dance Theatre/Chicago), Adrain Bolton (Founder/Co-Director), Gloria Contreras (Founder/Director of Taller Coreografico de UNAM, Mexico City), Maurice Johnson (Innovative St. Jazz Artist), and Chilian choreographer, Felipe Oyarzun; along with their dynamic company members: Joan Ayap, Vanessa Carmichael-Elder, Carolyn Davis, Chandini Darby, Hai Do, Chika Imamura, Christine Doyle, Will Hernandez, Maurice Johnson, Kourtney Ginn, and Max Maisey. 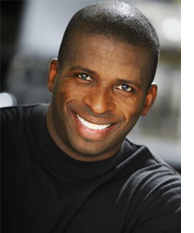 TDC is proud to announce the appointment of Maurice Johnson as Associate Artistic Director as of November 1, 2013. 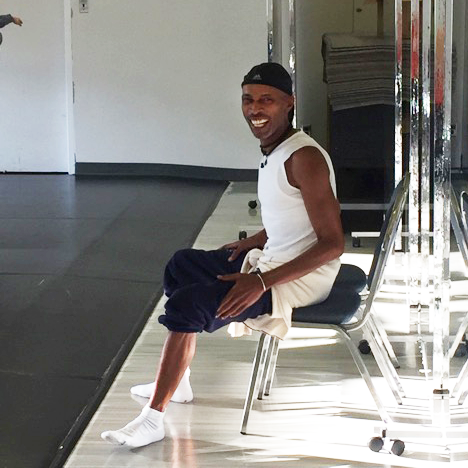 For the past 7 years, Maurice’s great talent, expertise, spirit and mentorship, as principle dancer as well as rehearsal director for the Company’s diverse repertory has been instrumental in maintaining TDC’s commitment to excellence in concert dance. Join in celebrating this exciting news for TDC! TDC is also proud to announce that Founder/Artistic Director, Miya Hisaka Silva, has once again received a prestigious 2014 Artist Fellowship from the DC Commission on the Arts and Humanities. This will be her second consecutive year to receive this award of excellence in dance in recognition of her achievements and service in the District of Columbia. August 16, 2015 – TDC in Japan. Performance at the Hiroko Mishima Ballet’s 20th Anniversary Ceremony, Kitakyusyu Performing Arts Center in Kitakyusyu City, Japan. 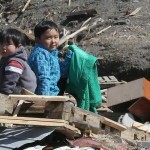 Sponsored by the Kitakyusyu City Committee of Education. February 7-8, 2015 (Sat. 8 pm, Sun. 4 pm) – Dance Place, 3225 8th St. NE, Washington, DC 20017. Feb. 9, 2014 (7-9 pm) – TDC Auditions: For Company Members and Apprentices for the 2014-2015 Season. Auditions Held at: Joy of Motion Dance Center/Bethesda Studio Location. 7315 Wisconsin Ave. Suite 180E, Bethesda, MD..
TDC is looking for experienced concert dancers trained in classical ballet/pointe, modern (Horton/Graham) and jazz techniques. TDC is interested in working with dance artists with a strong interest in multiple styles of dance and a focus on long term training. 2014-2015 Season includes paid rehearsals and performances in both the DC metropolitan area and an extensive West Coast Tour. Please arrive at least 30 minutes in advance to fill out audition application. Bring dance resume and dance shot. There will be a ballet, modern and jazz component. Ladies, please bring pointe shoes for the classical section. 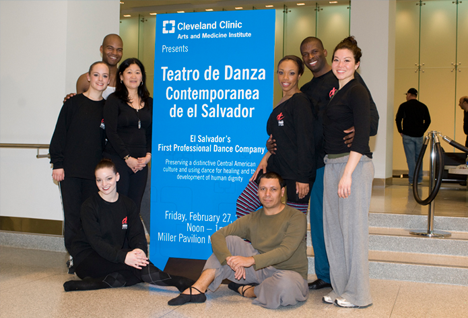 Come celebrate with El Teatro de Danza Contemporanea de El Salvador (TDC) as they re-birth of their name to The DC Contemporary Dance Theatre (DCCDT) on April 6, 7, 2013 (Sat. 8 pm, Sun. 7 pm) at Joy of Motion Dance Center’s Jack Guidone Theatre. This Preview Fundraiser/Incubator Series Performance presents excerpts of the Company’s new repertory choreographed by critically acclaimed choreographers, Kevin Iega Jeff (So Deeply Rooted Dance Theatre/Chicago), Francisco Castillo (Co-Founder/El Salvador); world premieres by blossoming young choreographers and Company members: Maurice Johnson, Cullen Massenberg, Sebastian Rousseau, Hannah Conn and Nancy Cantine; along with dynamic members: Vanessa Carmichael-Elder, Chandini Darby, Joan Ayap, Chika Imamura, Darian Moore and Will Hernandez. Also, mark on your calendars, the Company’s culminating performances on May 11-12, 2013 (Sat. at 8 pm and Sun. at 7 pm). as they proudly present DC’s 3rd Latin American Dance Festival and the 17th cultural exchange with El Salvador) at Georgetown University’s, Gonda Theatre. 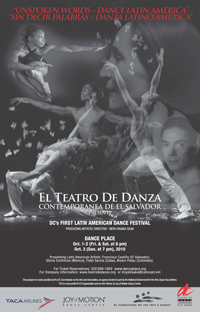 This annual Festival of diverse classical, contemporary and indigenous works presents internationally recognized Latino choreographers and world renown performing artists: Francisco Castillo; Juan Carlos Rincones (Venezuela); Fidel Garcia (Cuban, Dance Theatre of Harlem), Alvaro Palau (Columbian, Washington Ballet), Gloria Contreras (Director of Taller Coregrafico de UNAM, Mexico); along with America icon choreographer, Kevin Iega Jeff, and guest dancer Kim Parmer, among some of DC’s most outstanding dance talent. Come experience Latin American concert dance at its best. MARK ON YOUR CALENDARS NOW! -May 11-12, 2013 (Sat. at 8 pm and Sun. at 7 pm).) – DC’s 3rd Annual Latin American Dance Festival at Georgetown University’s Gonda Theatre, 37th and O St., NW, Washington, DC 20007. Ticket Prices: $30/Advance Purchase; $15/Students; $35/at door. To Purchase tickets: www.boxofficetickets.com (enter El Teatro de Danza). ALL TICKETS PURCHASED AT THE DOOR, MUST BE PAID BY CHECK OR CASH ONLY. Credit cards are only accepted for advance purchase. We recommend to purchase all tickets in advance OR to arrive at least 20 minutes prior to performance in order not to experience delays the evening of the show. Jose Carcamo, Maurice Johnson, Jose Luis Guillen, Cullen Massenberg and Francisco Castillo. For more excerpts, go to YouTube under El Teatro de Danza Contemporanea de El Salvador. Gonda Theatre Location and Parking: The Gonda Theatre at Georgetown University is located in the Davis Center for the Performing Arts, 37th and O St. NW, Washington, DC 20057. Off street parking as well as FREE PARKING GARAGE in Southwest Quadrangle parking garage via Prospect or Canal campus entrances. Welcome back Francisco Castillo, Salvadoran choreographer and Co-Founding Director of TDC, as he presents a full evening of his works along with virtuoso cast of Latin America dancers and guest artists. Due to last year’s overwhelming success of TDC’s Latin American Festival, TDC is proud to present DC’s 2nd Latin American Dance Festival, “Earth, Wind and Sky- Dance Latin America II” – “Tierra, Viento y Cielo-Danza Latino America II” - a powerful, passionate and diverse program of classical and contemporary dances from El Salvador, Cuba to Mexico at The Gonda Theatre at Georgetown University’s new state of the art Davis Performing Artson June 11, 2011 (Sat. at 8 pm). Producing Artistic Director, Miya Hisaka Silva, proudly presents this return performance and historical 15th cultural exchange with El Salvador, bringing together internationally recognized virtuoso Latino artists: Francisco Castillo (El Salvador); Gloria Contreras (Director of Taller Coregrafico de UNAM, Mexico), Fidel Garcia (formerly of Dance Theatre of Harlem), TDC, among a list of dynamo special guest artists! Don’t miss this once in a lifetime opportunity to experience Latin America dance at its best! TDC is proud to present the return of last year’s program and more, with an evening of some of Latin America’s finest choreography including 4 works of Francisco Castillo’s: Las Mares (The Oceans), a breathtaking, sculptural full ensemble work reflecting the two sides of mother nature; and his most monumental work, En El Hora Finale, created to the moving music of Vangelis for six of Latin America’s strongest men and reflecting upon life, death, devastation, life’s beauty, rebirth and hope; El Ultimo Wagon (The Last Train), a poetic, melancholy man’s solo about moving forward yet leaving much behind; and signature piece, Pajaros Pintados (Painted Birds) his full company high energy indigenous signature work capturing the beauty of mother nature in Latin America. Mexican icon and legend, Gloria Contreras will present her luscious and romantic duet composed to Mozart’s “K-622”, showcasing Cuban virtuoso classical dancer, Fidel Garcia, and special guest artist, Michelle de Fremery, formerly with American Repertory Ballet of NJ, and more. These internationally recognized world class artists have once again come together in collaboration to create a powerful, passionate and inspiring program, not to be missed! Due to the overwhelming success of TDC’s Latin American Festival last year, TDC is proud to present DC’s second Latin American Festival on June 11, 2011 at Georgetown University’s new state of the art, Gonda Theatre. “EARTH, WIND AND SKY: DANCE LATIN AMERICA II” =”TIERRA, VIENTO Y CIELO: DANZA LATINO AMERICA II” , presents a full evening program of Francisco Castillo’s work in collaboration with some of Latin America’s most virtuoso artists include: , Gloria Contreras (Mexico), Fidel Garcia (Cuba), members of TDC, among other special guest artists. 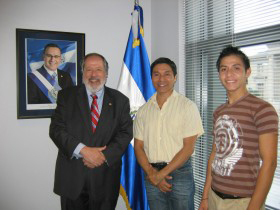 This 15th Cultural Exchange with El Salvador has been made possible by the generous support of the DC Commission for the Arts & Humanities, in part by the National Endowment for the Arts, Grupo Taca Airlines, and many private patrons. Come celebrate and welcome back Francisco and our dancers from El Salvador. Don’t miss this once in a lifetime opportunity to experience Latin America at its best! Georgetown University’s Gonda Theatre is located in the Davis Performing Arts Center near the campus entrance of 37th and O St. NW, WDC 20057. Off street parking and FREE PARKING GARAGE on the Southwest Quadrangle via Prospect or Canal Rd. entrance. $30/General Admission; $15/Children 17 and under. TO PURCHASE TICKETS: www.boxofficetickets.com (enter El Teatro de Danza). Tickets also available at Gonda Box Office the day of the show starting at 6:3o pm. For more information: 202-316-5277. “…body and spirit filled and moved by the dance and music alone, rich with nuance and physical inflection, physically sumptuous…hypnotic, dramatic detail, energy, elegance, sensuality, focus and undeniable passion”. Francisco Castillo, Jose Luis Guillen, Vanessa Carmichael-Elder, Jose Carcamo, Alexandria Franklin (courtesy of Dissonance Dance Theatre), Michelle de Fremery, Elizabeth Fujii, Fidel Garcia, Chandini Gilchrist, Chika Imamura, Darian Moore, Maurice Johnson and Cullen Massenberg. This historical event will bring together internationally recognized virtuoso Latino artists: Francisco Castillo (El Salvador); Gloria Contreras (Director of Taller Coregrafico de UNAM, Mexico), Fidel Garcia (formerly of Dance Theatre of Harlem), and members of TDC, among a list of dynamo artists! Don’t miss these once in a lifetime opportunities experience Latin American dance at its best! The Program will be an evening of all new works including world premieres choreographed and danced by some of Latin American’s most world renown artists. Two world premieres by Francisco Castillo: Las Mares (The Oceans), a breathtaking, sculptural full ensemble work reflecting the two sides of mother nature; and his most monumental work, En El Hora Final created to the luscious music of Vangelis for six of Latin America’s strongest men and reflecting upon life, death, devastation, life’s beauty, rebirth and hope; Mexican icon and legend, Gloria Contreras will premiere her luscious and romantic duet composed to Mozart’s “K.622”, showcasing Cuban virtuoso classical dancer, Fidel Garcia. And Eduardo Rogel, Director of the National Company of El Salvador, will present his light-hearted and uplifting classical quintet, Concierto, created to the playful music of Joquin Rodrigo. These internationally recognized world class artists have come together in collaboration to create a powerful, passionate and memorable program, not to be missed. Thank you to everyone who attend and contributed to the Preview Performance and celebration on July 17th! ©Copyright 2013. All Rights Reserved. 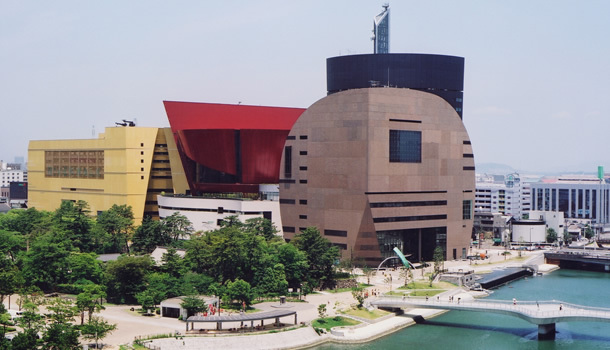 El Teatro de Danza Contemporanea de El Salvador.